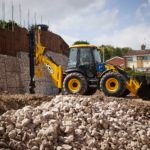 PHPD has teamed up with JCB to look at the perennial challenge of effective piling solutions for housebuilders – and a ‘ground-breaking’ new machine that could provide the answer. The telescopic Kelly bar can be closed down to give a travel height of just 4m. Piling and ground engineering for a housebuilding site can often be an expensive, complicated and time-consuming business. Before commencement of a building project, most developers will employ the services of ground investigation contractor to undertake a geotechnical ground investigation. Armed with an appreciation of the ground profile, structural engineers can then decide on the appropriate foundations required on the site. In many instances piling is not required as the ground conditions are suitable for standard strip foundations. However, in the event of poor ground conditions with weak, compressible material, then a piled solution may be required to prevent the risk of structural failures and subsequent insurance claims. For the convenience of a complete solution, developers will often turn to a piling contractor who can offer a full design and works package – including a warranty which meets the requirements of the NHBC, HSE and insurance companies in general. The most common types of piling in the UK housing industry include continuous flight auger, vibro stone columns, driven pre-cast concrete or driven steel tubes. Finally, there is the rotary method which provides a belt and braces approach providing maximum reassurance for housebuilders and insurers alike. Preparing the levels, constructing a piling mat to meet the required specifications and then fitting the actual piling operation into a fast-moving build schedule can create numerous headaches for the groundworker. Indeed, piling contractors often require continuous plot availability, leading to high standing time and labour costs escalating further. So, what if house builders could bring these operations in house, with a flexible solution that integrates into their own prescribed programme and eradicates the need for piling mat, transport, additional labour or main contractor attendance? In certain geotechnical conditions, the use of a conventional tracked piling rig remains the most appropriate approach. 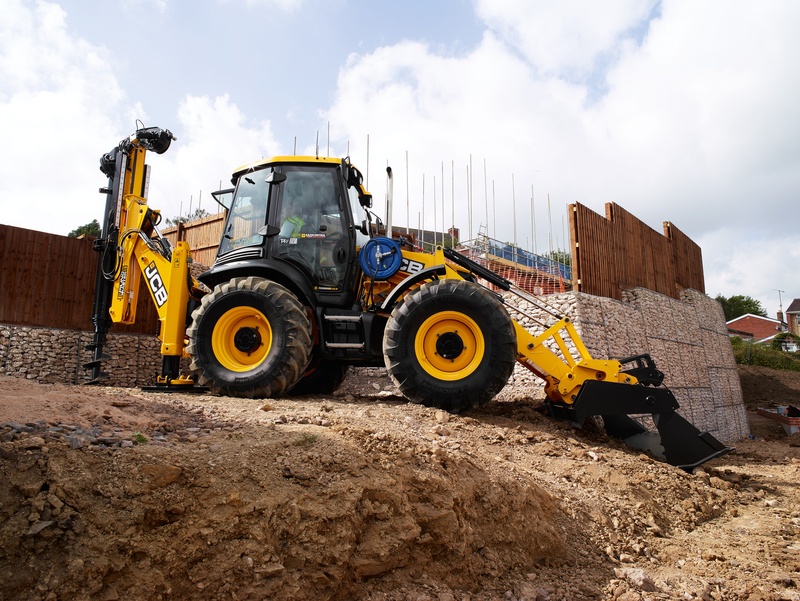 However, where there is firm clay and the absence of water, JCB has developed a solution that can bring developers proven savings of up to £4,000 per plot. The JCB Pilingmaster is built around the company’s iconic 4CX backhoe loader. 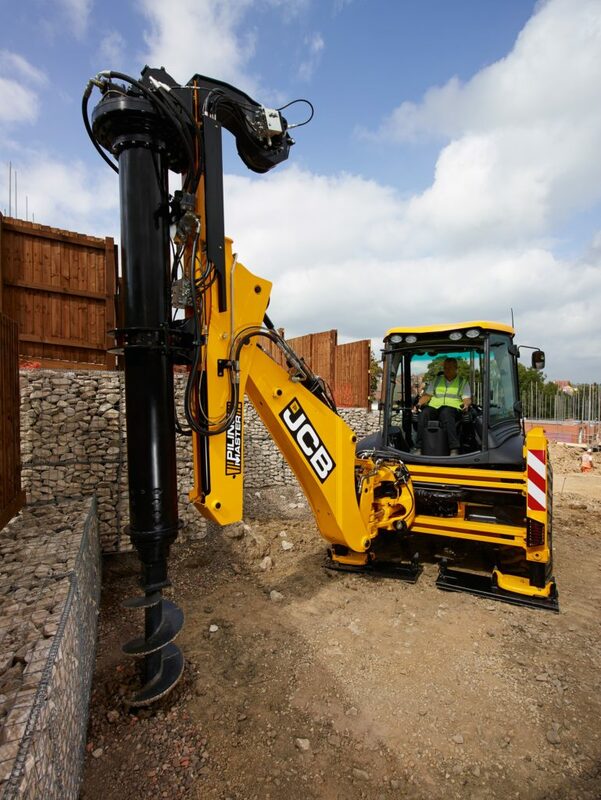 Built around the company’s iconic 4CX backhoe loader, the JCB Pilingmaster base model carries a dedicated rotary piling rig comprising a simple open bore solution. It can drill to a maximum depth of 14m with a maximum diameter of up to 600mm. Central to the design is a seven-section telescopic Kelly bar, which is built in-house to the company’s own design. It boasts three hydraulic motors on the piling rig head supplying the necessary 12,500Nm of rotary head torque. These work through an excavator slew-ring to deliver a top speed of 90rpm. Winch performance delivers 2,500Nm of pullback force, while the dipper arm mast offers 5,000Nm of pullback force and 3,300Nm of crowd force. With its rubber-tyred backhoe base, the JCB Pilingmaster’s big advantage over competitive machinery is its mobility. The telescopic Kelly bar can be closed down to give a travel height of just 4m. This allows the machine to travel independently to site or between projects at up to 40kph, reducing transport cost and downtime. The big wheel, four-wheel drive and steer chassis also provides the machine with excellent maneuverability when on site, allowing it to access confined spaces and to cross unprepared ground. The machine doesn’t require an engineered piling mat to operate, cutting time and costs. With the backhoe’s sliding mounting it is also be possible to drill up to three piles from a single position, further increasing time on site. The JCB Pilingmaster can drill to a maximum dept of 14m with a maximum diameter of up to 600mm. Importantly, the machine will also change how developers plan and execute their piling works, by eradicating the need for specialist piling contractors and all the cost and logistical challenges that brings. By bringing control over the build programme in-house it creates savings through no requirement of fully designed piling mats, main contractor attendance, additional labour, transport or spoil removal. With ever increasing urbanisation, this compact, mobile solution with rapid roading capability proves an efficient option. It can access inner city sites – often within controlled zones – without the hugely expensive need to transport heavy equipment on low loaders. 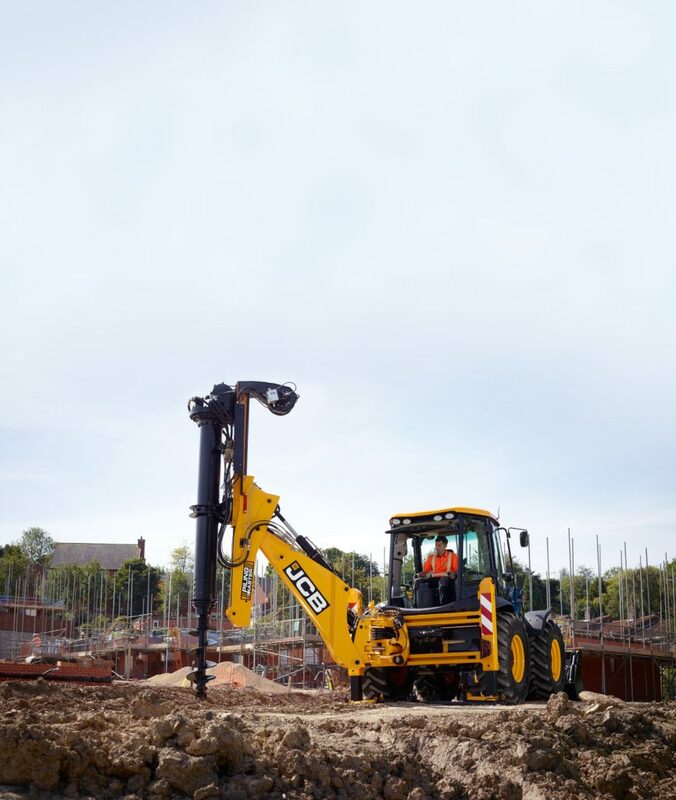 UK housebuilders and ground investigation contractors alike have already recognised the JCB Pilingmaster’s qualities. And with huge interest in the USA, major potential in other less established piling markets and further possibilities in rail and infrastructure, opportunities for this innovative foundations solution are truly piling up.